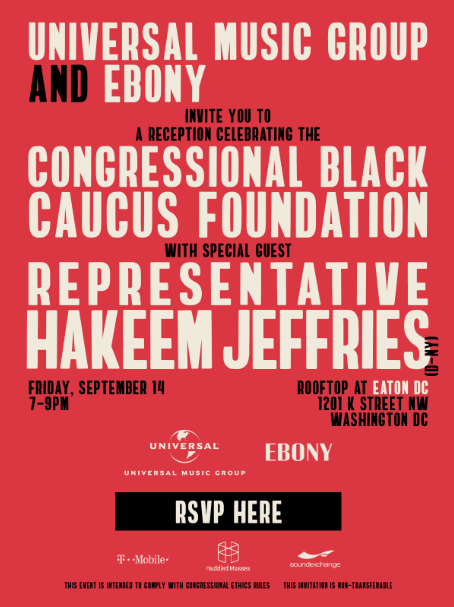 Universal Music Group is hosting its annual Congressional Black Caucus Foundation reception in Washington, D.C., this Friday (9/14) from 7-9PM on the rooftop at Eaton DC. The affair will be co-hosted by Ebony and will feature special guest Rep. Hakeem Jeffries. Additionally, Hakeem Jeffries Congressional Black Caucus Forum on Criminal Justice & Music, will feature a panel discussion with Meek Mill, CNN host Van Jones and author and professor Dr. Michael Eric Dyson along with Universal Music group general counsel Jeffrey Harleston and University of Maryland, Baltimore County professor Michelle R. Scott. The panel is taking place on 9/14 from 2-4PM EST at Walter E. Washington Convention Center, and will explore the complexities of music and social justice in America, illuminate the supportive influence of modern-day musicians on activism and discuss ways that artists can produce popular and politically engaged music.